Kokanee Mountain Zipline celebrates second season with community fundraiser. The tour operator will be hosting a community day fundraiser on Monday, May 30 (a Pro-D day) where they will offer up 100 discounted spots at 50% off, with all proceeds being shared by the Balfour/Harrop Fire Department and Nelson Search and Rescue. Kokanee Mountain Zipline has been open for less than a year, but co-owners Jay and Todd Manton are already learning that it takes the support of a community for a business to succeed. That’s why they’re starting their second season of ziplining by giving back. The tour operator will be hosting a community day fundraiser on Monday, May 30, (a Pro-D day) where they will offer up 100 discounted spots at 50% off, with all proceeds being shared by the Balfour/Harrop Fire Department and Nelson Search and Rescue. “We’re donating the guides’ time and the use of the aerial park, plus any other donations guests want to provide,” explains Jay Manton. Kokanee Mountain Zipline opened Mother’s Day weekend and has operated on Saturdays and Sundays until the Victoria Day weekend (May 21-22). After that, they will offer daily tours throughout the week. Meanwhile, the Manton boys have been busy touching up the ziplining course and training new guides to meet the anticipated surge in demand this season. By the time they begin operating at full capacity, Jay expects to have 10 guides available for tours. “To address issues we faced last year, we’ve increased capacity for the 2016 season to help accommodate walk-ins. Much like stepping off of a zipline platform, starting a zipline company requires a leap of faith. Looking back on the inaugural season, Jay says the response to Kokanee Mountain Zipline exceeded expectations. “You have no idea what you’re getting until you’re out there trying the course,” says Jay. “It’s not just the ziplining, it’s the view. That exceeded our expectations, and that’s why the ridership exceeded our expectations. Kokanee Mountain Zipline is the only ziplining operation in the Kootenay Mountains. With six unique ziplines, combined with bird’s-eye views of Kootenay Lake, Kokanee Creek canyon and surrounding mountains, it is proving to be one of the top BC attractions of its kind. As thrilled as Jay and Todd are at seeing a solid tourist turnout, they are equally appreciative of the local support. When the summer vacationers started to dwindle as the start of the school season neared last fall, people from surrounding areas started showing up. “When a local tells you that they’re coming back to do it again, that’s a good feeling,” smiles Jay. One of the more pressing items on Kokanee Mountain Zipline’s to-do list during the offseason was to improve accessibility to their main staging area, which is 2.2km up Kokanee Glacier Park Road. There were some rough patches in the road that made it difficult for two-wheel-drive vehicles to make it up. To address this, Kokanee Mountain Zipline partnered with the Ministry of Transportation to perform some much-needed road improvements. On May 12, the Global News Hour paid Kokanee Mountain Zipline a visit. “We had an awesome time with the news team. The incredible reception was a great start to the 2016 season.” You can watch what the Global News Hour team got up to on the Kokanee Mountain Zipline blog. Kokanee Mountain Zipline is a premier outdoor attraction for people looking for exciting things to do in Nelson and the surrounding area. 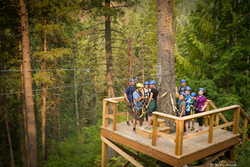 Our aerial park, which is located along Kokanee Glacier Park Road, features six unique ziplines set among pristine forests and high above Kokanee Creek canyon. Our family-friendly tours are led by highly trained guides who ensure guest safety and comfort every step of the way.